1. Login to ArcGIS Online? Follow the steps below to create a public account. From the website, click the Sign In link on the upper right or access the sign in page directly from https://www.arcgis.com/home/signin.html. Click the Create a Public Account button. You are redirected to a page to create a new account. Enter a user name that is between 6 to 24 characters in length and contains letters, numbers, or a combination of both. You can also use the following special characters: . (dot), _ (underscore), and @ (at sign). Other special characters and spaces are not allowed. Your user name is case sensitive. Enter a password that is between 4 to 14 characters in length and contains letters, numbers, special characters, or a combination. Spaces are not allowed. Your password is case sensitive. Reenter your password to confirm. Enter the name of your organization, for example, your employer, school, or agency. Enter your email address. Reenter your email address to confirm. Select an identity question and enter an answer. This information is used to validate your identity in the event you forget your password. You are automatically signed in to the website and you see your profile page. From here you can create a new map or search for an existing map using the search box. 2. Query the database for particular datasets? Select "Search Data" from the menu and then choose any of the "Search By ... " options. You will be directed to the Southeast Alaska GIS Library’s geoportal application, where you can query the entire GIS Library for datasets on the basis of name, theme or keyword. The results of your query will be returned via a selectable list. The Geoportal application allows you to download the data, connect to live map services and explore the dataset's metadata. If you have trouble finding a dataset or know of a dataset that could be added or linked to the GIS Library, please let us know by filling out the form on our Contact page. 3. Download datasets from the GIS Library? Once you've located the dataset(s) that you wish to download via the search functionality, simply expand the selection by clicking on the name of the dataset and then clicking on the "Download" link at the bottom of the dataset's description - this link will present the user with a zipfile containing the dataset that can be downloaded/saved to the users local computer. NOTE: Download options/commands vary on the basis of particular web browsing clients, but users should choose to "save" the datasets to their local environment - i.e. do not "open" the dataset. The datasets are provided for download in a zipped, file geodatabase format. For users who are unable to consume datasets in file geodatabase format, please contact the GIS Coordinator to make alternative formatting arrangements. 4. Contribute datasets to the GIS Library? Ad-hoc data contributions to the GIS Library are welcomed provided they meet certain criteria - e.g. they are publicly licensed, have associated metadata, are provided in a standardized format, etc. We can assist you in preparing your data. Please contact the GIS Coordinator to discuss. 5. Connect to web mapping services from the GIS Library? The GIS Library is hosting a number of web mapping and data streaming services that meet data provision requirements for both stakeholders and regional users. Many of these services are available through our web maps. Please explore our current projects using the Project menu. For users wishing to connect to web mapping services, the services are discoverable via the GIS Library's Geoportal application. The easiest way to find map services is to acces the Geoportal Browse page. From here, expand the Catalog and Content Type folders. Choose Live Map Services. To further fillter the results, enter a search term in the Filter input box. There are a number of ways to connect to the web mapping services, by clicking on the service name and then using one of the options at the bottom of the selected service. Many of our web mapping services are available at ArcGIS Online. Search for the Southeaset Alaska GIS Library or visit our ArcGIS Online page at http://seakgis.maps.arcgis.com. To connect to the web mapping services in ArcGIS Desktop, step by step instructions are provided here. WEB SERVICES DIRECTORY - Updated 3/14/2013 PLEASE NOTE: Some of the services listed here are under development and subject to unscheduled modification. The GIS Library offers no assurances of availability for any service that is noted as being in a draft format, under development or undergoing testing. Also, It is advised that these services be accessed via a high speed internet connection due to the size and complexity of the datasets being delivered over the web. Please contact the GIS Coordinator if you have questions about any of the services. 6. Write metadata appropriate for contributing to the GIS Library? Please see the attached Power Point presentation for a brief metadata overview from the GIS Library. 7. Use the new GNSS base station? There is an ever increasing demand for increased spatial accuracy for field data collection and mapping. Given the steep terrain, northern latitude, and dense forest canopy conditions of Southeast Alaska, data collection with systems based solely on GPS has been difficult with mapping grade equipment, particularly when filtering for quality signals. We now have additional Global Navigation Satellite Systems (GNSS) available for use, particularly the mature GLONASS constellation, that when paired with the United States’ GPS constellation tremendously increases productivity and accuracy of field data collection. GNSS rover receivers significantly increase productivity and accuracy for both public and private interests and extend academic and research opportunities. To realize the full benefit of GNSS receiver capability and maximize accuracy, the data collected with GNSS receivers must be corrected with GNSS reference data. While an extensive network of CORS and UNAVCO base references stations and even real-time WASS corrections are available for correcting only GPS data, southeast Alaska lacks a broader spectrum of GNSS correction capability. A GNSS reference base station will serve many interests and business areas. The Trimble NetR9 reference receiver supports a wide range of satellite signals; currently, the procured NetR9 platform is capable of tracking signals from GPS, GLONASS, Galileo, BeiDou and QZSS constellations. Additionally, real-time web broadcasted corrections are an option, but currently only GPS and GLONASS signals are being tracked. 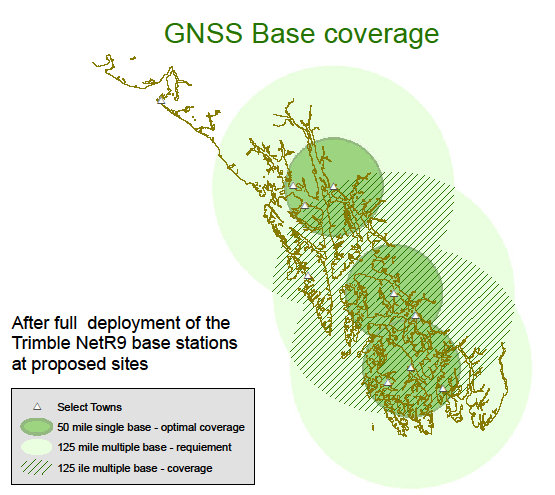 A new USFS sponsored GNSS base station has been activated in Juneau. 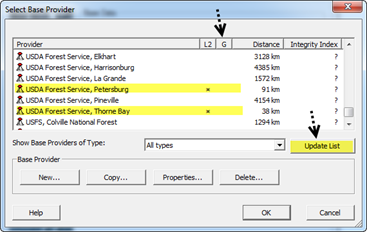 The guide will assist you in setting up that station as a user defined station in your GNSS post processing software. There are currently 3 Alaska Region USFS sponsored GNSS base stations. The first two (Thorne Bay and Petersburg) have been in place for a while but, NOW they will automatically show up as a base provider in your GNSS software, such as Trimble Pathfinder Office or Trimble Positons, that utilize the Global Reference Station List. You'll likely have to update your provider list for them to appear. Currently, they don't show as if they are GLONASS capable (with an * under the G), BUT they are. A ticket has been placed with Trimble to fix this error in the listing and hopefully will be corrected soon. But rest assured, you can post process your GLONASS data (and GPS) with those stations. The new Juneau station is being registered now and will also soon appear with the other listings, negating the need to set it up a user defined station. This is a screen shot from PFO illustrating the update list button and the two USFS GNSS base stations. Again, they are GLONASS capable even though the listing doesn't indicate that fact. Targeted spatial distribution optimizes coverage for areas of active management where precision data collection is of high priority. To meet H-Star / duel frequency post processing base line requirements, it is recommended that post processing with a single base provider be within 50 miles (80 km) or 125 miles (200 km) with multiple base provides. These are the solutions used to calculate the ITRF00 Ep. 1997.0 positions. These solutions are in reference to one 24hour static collection but that collection was chosen from among several collected where the it was closest to the average of all collections and in consideration of the RMS values.